Decorate and transform a room with light! The following two photo’s are resized for mobile viewing. If you are viewing from a mobile phone or tablet, Rotate your device into the landscape orientation. Mobile readers can also use the pinch/grab feature to zoom. 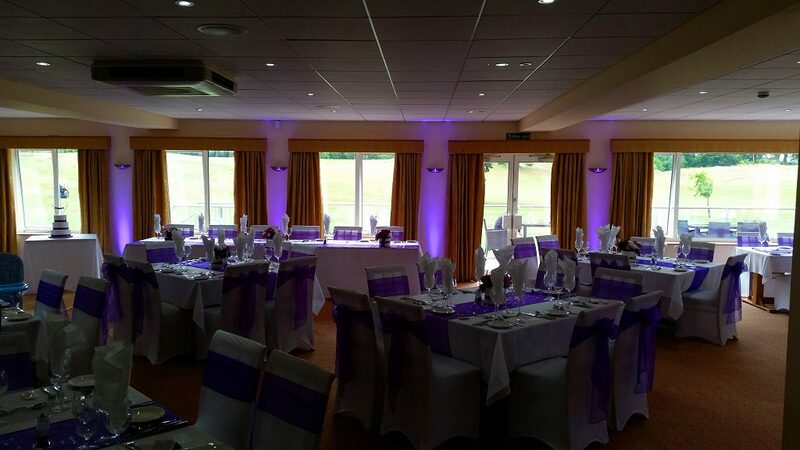 Uplighting is a simple yet highly effective decoration for your venue. Up light bare walls, Bounce colour off the ceiling and enrich the atmosphere. Compliment or contrast, When it comes to colour… The choice is yours. Using the latest RGB (Red / Green / Blue) technology our lighting units provide vivid primary colours. With multiple light blending its possible to achieve subtle and transient colours to match a chosen theme. Whats more, Our LED units run cool! That’s peace mind with the ever playful nature of children. The New Saints Award Ceremony. 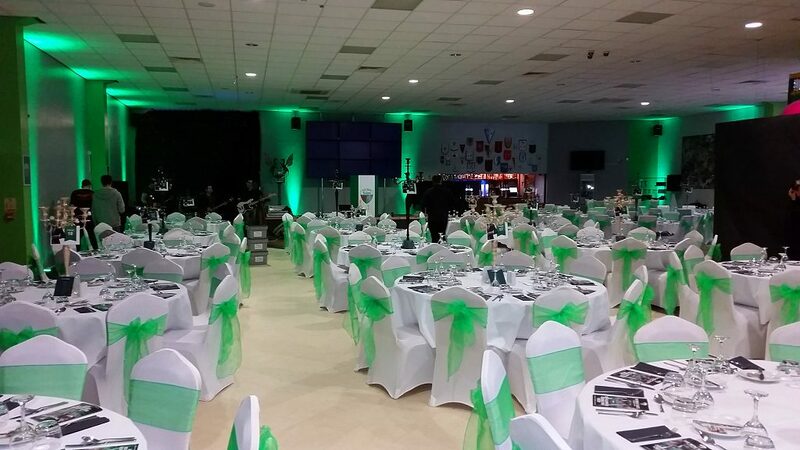 Striking green colour really brings the venue to life! Red uplighting and colour-wash produce this stunning effect. If your venue has walls that are of a reasonably light colour (white, cream, magnolia, grey etc) then there is no reason why uplighting shouldn’t work for you. The exact shade and intensity will ultimately depend on the wall colour but its rare for a venue to paint walls dark colours in public area’s. If you are unsure of a particular venue, Contact us and we can advise. Well yes, The light units do require power but electrical sockets do not need to be located exactly where you would prefer the units to be sited. We can run discrete cables to the units from the nearest electrical sockets and as these lights are LED, there is no issue of excessive power draw. Note: Rubber Cable Protectors will be used when it is absolutely necessary to run cables past high traffic area’s such as doorways. That depends entirely on personal preference. 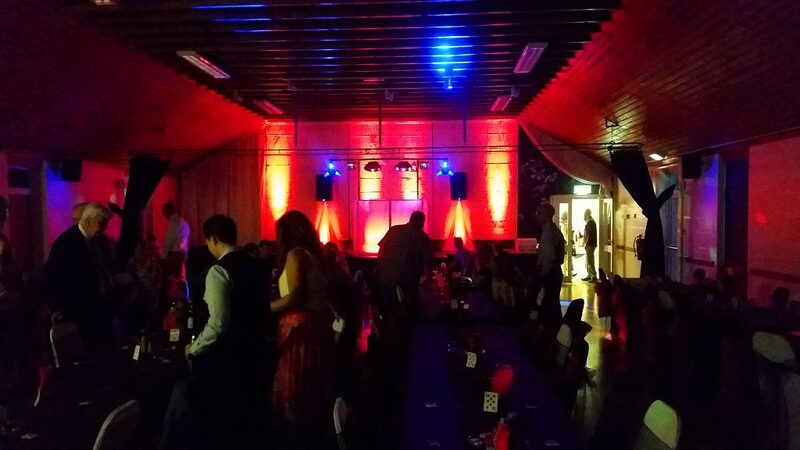 If we have DJ’d in your chosen venue before, there is a good chance we can advise how many units would be suitable. Between windows, corners and long stretches of wall are the best places to site a lighting unit but it is venue specific. We hire up lighting by the unit and have up to 10 available. Hire price based on 10x Up-Lighter units. When hired with other services or as part of our DJ package we offer these singularly at £5.00/unit. If hired as part of our Professional DJ packages, There will be no travel charge.